When carbon steel, carbon alloy steel, and tool steel pass Austempering process, they will improve their mechanical properties. 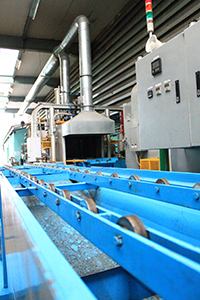 Austempering process is the process of heating steel part until it reach its Austenite point, after that the steel part will be quenched into liquid salt, which is called salt bath or metal bath. Then, the steel part will be maintained at stable temperature in hot bath until its structure completely change into Bainite. There may have retained austenite, but we must carefully control the occurrence of Martensite. Proper hardness with each application. The comparison table of SAE 5150 steel that was passed Austempering process and Quenching & Tempering. B.K.J Engineering CO.,LTD has knowledge, experiences, and high technology equipments of Austempering for making any type of steels increase their elasticity, toughness, which make work piece resist to crack and distortion.